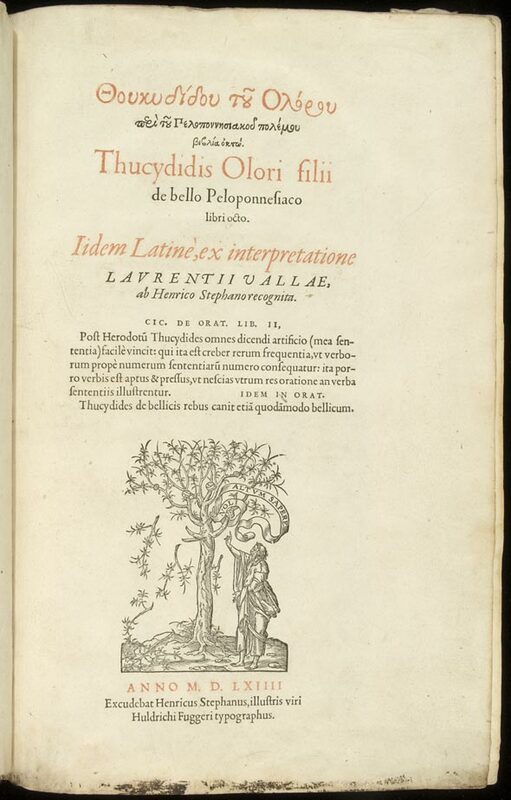 Thucydidis Olori filii de bello Peloponnesiaco libri octo. Geneva: Henricus Stephanus (Henri Estienne II), 1564. 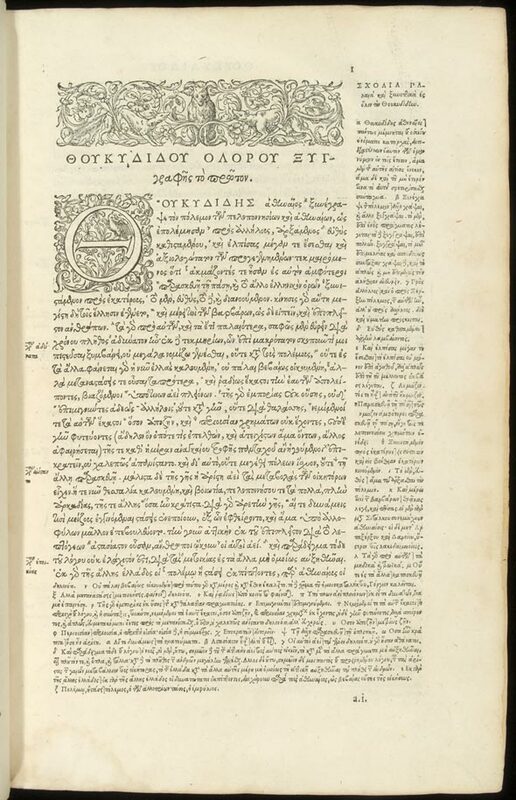 The publisher and editor of this edition of Thucydides’ History of the Peloponnesian War was Henri II Estienne (1528/31-1598), the eldest son of Robert I Estienne (1503-1559). Henri II was perhaps one of the most accomplished members of a dynasty of learned publishers whose beginnings can be traced to the first years of the sixteenth century. The founder of the Estienne publishing firm was the father of Robert I, Henri I Estienne (d. c. 1564). 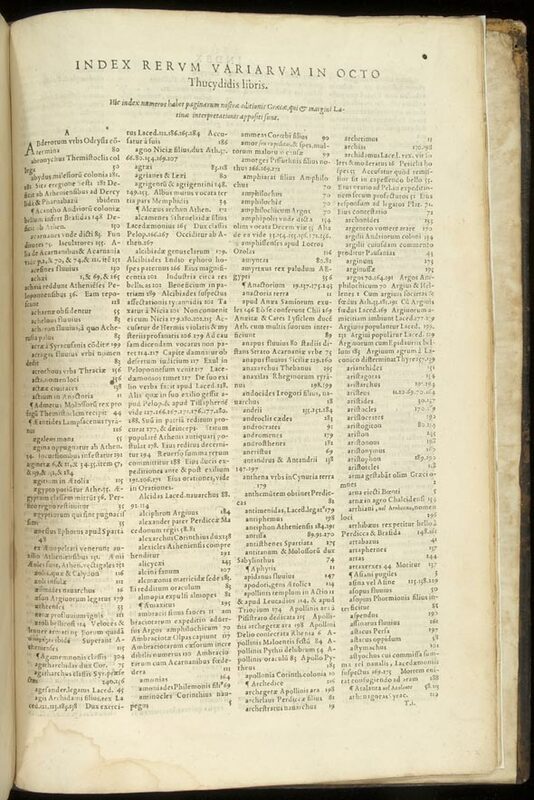 In fact, his name first appears in the colophon of an edition of Jacques Lefèvre d’Etaples’ commentary of Aristotle’s Ethics: Artificialis introductio per modu[m] epitomatis in dece[m] libros Ethicoru[m] Aristotelis adiectis elucidata co[m]mentariis (Paris: Wolfgang Hopyl and Henri Estienne, 1502). The colophon is dated 7 May 1502, indicating that the book was completed at the University of Paris by Wolfgang Hopyl and Henri Estienne, and that it could be purchased at the Rabbits’ Press (in officina cuniculorum). This colophon also shows that from its first extant imprint the name Estienne always appeared in Latin as Stephanus, the adaptation of the Greek form, Stephanos. However, Henri I had already entered the milieu of printers by marrying Guyonne Viart, widow of Wolfgang Hopyl’s former partner, the master-printer Johann Higman. From these two printers he inherited an important network of scholars. Particularly decisive was his working relationship with the leader of the French humanist movement, Jacques Lefèvre d’Etaples (c.1460-1533), which started a successful family business specialized in the edition and publication of scholarly books (Armstrong, 1954: 3-17; Schreiber, 1982: 9-10). In general, Estienne books did not only fulfill a utilitarian purpose, but also followed high aesthetic standards as shown in the magnificent typographical achievements of our Collection Highlight. Henri II Estienne was a very productive editor of classical texts who eventually joined the trade of his family. 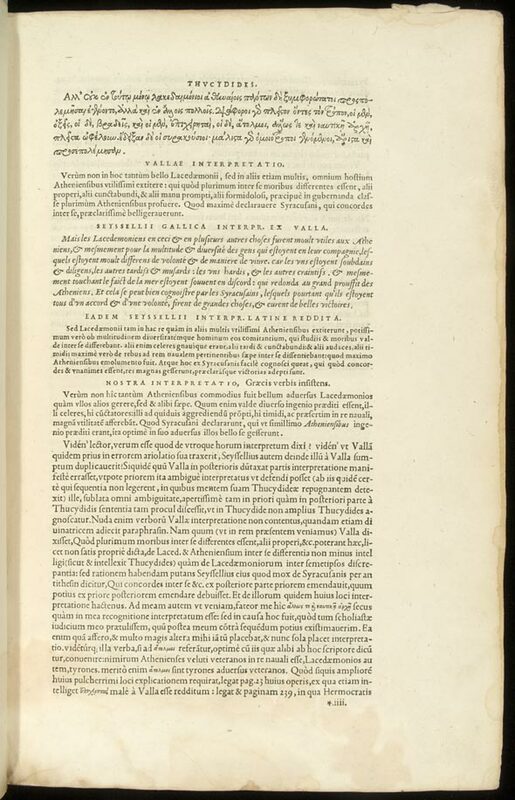 While still a teenager, he assisted his father in editing the Greek text of the editio princeps of Dionysius of Halicarnassus’s Early Roman History: Dionysii Halicarnassei Antiquitatum romanarum lib. X (Paris: Rob. Stephanus, 1546). He also traveled extensively through Italy, the Low Countries, and England, seeking Greek manuscripts. On his father’s death in 1559, Henri II took control of the Geneva family business, with financial support from Ulrich Fugger, a member of an Augsburg banking family (Schreiber, 1982: 127-8). 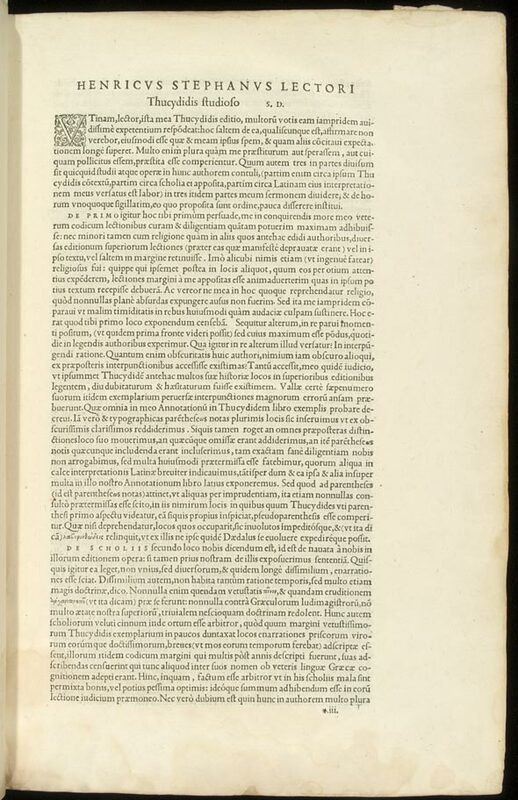 On the bottom section of the title page displayed below, one can read Henri II’s acknowledgment of this support as he defines himself as the printer of the illustrious Ulrich Fugger: … illustris viri Huldrichi Fuggeri typographus. The earliest version of the famous Estienne printing device was first employed by Robert I in 1526. It consisted of an olive tree with one of its branches falling off. It also included the Latin motto: Noli altum sapere: Be not high-minded.In our title page we find a more sophisticated version. We see a bare foot, bearded man at the foot of an olive tree, pointing up to the branches. There are several branches falling off, and others have been grafted into the tree. Again, the motto in this edition is noli altum sapere, which, in fact, would be expanded in other Estienne imprints as noli altum sapere sed time: Be not high-minded but fear.What is the meaning of this device? Shall we assume that there is a serious iconographic message as the one contained in the well-known Aldine device? (See the brief discussion included in the Collection Highlight: Suetonius. Sexti Aurelij Victoris. For if the firstfruit be holy, the lump is also holy: and if the root be holy, so are the branches. And if some of the branches be broken off, and thou, being a wild olive tree, wert graffed in among them, and with them partakest of the root and fatness of the olive tree; Boast not against the branches. But if thou boast, thou bearest not the root, but the root thee. Thou wilt say then, The branches were broken off, that I might be graffed in. Well; because of unbelief they were broken off, and thou standest by faith. Be not highminded, but fear: For if God spared not the natural branches, take heed lest he also spare not thee. Behold therefore the goodness and severity of God: on them which fell, severity; but toward thee, goodness, if thou continue in his goodness: otherwise thou also shalt be cut off. And they also, if they abide not still in unbelief, shall be graffed in: for God is able to graff them in again. For if thou wert cut out of the olive tree which is wild by nature, and wert graffed contrary to nature into a good olive tree: how much more shall these, which be the natural branches, be graffed into their own olive tree? We might read the motto as a manifesto of intellectual humility in the presence of revealed truth, directed alike at excessive dogmatism on the part of Christians and of excessive presumption on the part of ‘humanist’ rationalism (Armstrong, 1954:10). Armstrong’s interpretation is certainly very persuasive, but we still need to know the meaning of the olive tree. On this point, F. K. Schreiber convincingly argues that there is a connection between the olive tree and the name Estienne. The latter is the French version of the Greek stephanos, which, in turn, means crown, or wreath, suggesting the crown made of olive twigs awarded as prizes. Therefore, Schreiber concludes that the olive tree represents the signature of the Estienne family. To support this thesis, Schreiber refers to other examples of names being linked to the iconography of a trademark. For example, the use of rabbits in Simon de Colines’ devices alludes to the meaning of Colines: rabbits in English, cuniculi in Latin (in officina cuniculorum) (Schreiber, 1982: 247-9). The idea to include an address to the reader was first introduced by Henri II’s father, Robert I Estienne. On the whole, these addresses contained an explanation of the merits of the edition, appealing for the support of the reader. The personal, almost intimate style of these prefaces dramatically contrasted with the traditionally pompous addresses to illustrious patrons. Indeed, this type of approach is a clear example of how the Estienne family sought intellectual independence in their publications. 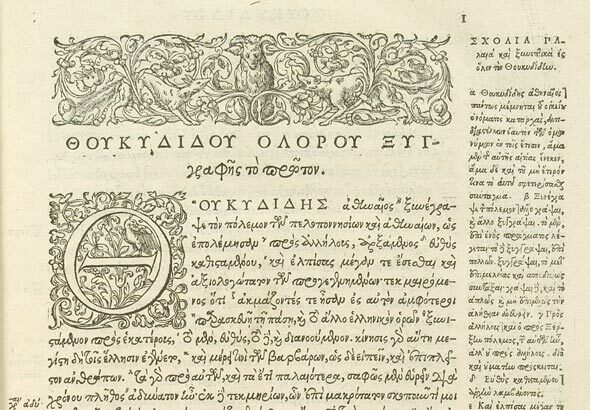 Our book of the month is a copy of the first Estienne edition of Thucydides, and the first to print the Greek text along with a Latin translation. Although the title page says that the translation is by Lorenzo Valla (1404-1457), and then revised by Henri II (ex interpretatione Laurentii Vallae, ab Henrico Stephano recognita), it is almost entirely by the latter (nostra interpretatio). For instance, in the page below one can see the scholar at work. By comparing the Greek original with passages from Valla’s Latin translation and Seyssel’s French version, Henri shows that Seyssel perpetuated many of the errors of Valla. Henri also included the Greek scholia surrounding the Greek text (Schreiber, 1982: 138). Adams, H.M. Catalogue of Books Printed on the Continent of Europe, 1501-1600 in Cambridge Libraries. 2 vols. Cambridge: Cambridge University Press, 1967. Armstrong, Elizabeth. Robert Estienne, Royal Printer; an Historical Study of the Elder Stephanus. Cambridge: Cambridge University Press, 1954. Renouard, Antoine August. Annales de l’imprimerie des Estienne; ou, Histoire de la famille des Estienne et de ses editions. Paris: J. Renouard et cie, 1843. Schreiber, F.K. The Estiennes: An Annotated Catalogue of 300 Highlights of their Various Presses. New York: E.K. Schreiber, 1982. ________. Simon de Colines: an Annotated Catalogue of 230 Examples of his Press, 1520-1546. Provo, UT: Friends of the Brigham Young University Library, 1995.